Charlie: We walked eight miles today from Moratinos to Sahagun, walked around Sahagun and then took a train 40 miles to Leon. We wanted to skip a long day that stretch would require and avoid walking through the suburbs is Leon. So far we have walked 198 miles in 22 walking days. Wynette’s blisters are doing much better and we think we can start walking longer days, like 10 to 12 mile days. Our plan is to walk from Leon to Santiago, 190 miles, in 16 to 18 days. That still leaves us a few days to go to Finisterre and maybe walk a couple of days along the coast. We just got into the province of Leon after being in Palacia for a week or so, over the Meseta. 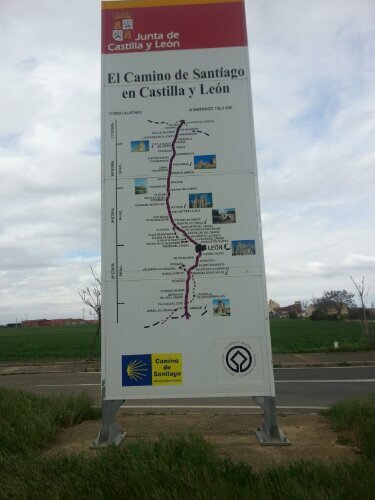 This useful sign was on the way into Sahagun.